What on earth is happening to platinum? The bearish price action in platinum has some of our clients wondering just what to expect. We are always happy to give our take on the markets. Below you’ll find a recent customer question along with our answer. Platinum is used in autocatalysts, coins, and jewelry. Article first published on the Sharps Pixley website, and lightly edited here, looking at the strong performance of gold over the past week, but also the weakening of the U.S. dollar index. Since Donald Trump assumed the Presidency of the world’s richest and most powerful nation, the US dollar index (relating the dollar to a basket of other currencies) has fallen by around 11% accounting for much of the increase in the gold price in US dollar terms. By contrast, the gold price in Euros has actually fallen by 1% over the past year, so what may appear to have been an appreciation in the gold price has been more a reflection of the depreciation in the value of the supposedly mighty US dollar. It’s only that most people around the world look primarily at movements in the gold price in the US dollar – as we do in the title of this article – that the gold price is seen as actually having advanced. But gold in US dollar terms does provide a useful benchmark as over time the dollar is probably the world’s most stable currency and is, for most nations, their primary reserve currency in their foreign exchange holdings. This relationship between gold and the US dollar, with the former providing perhaps the most overt indication of how the greenback is doing vis-à-vis other currencies is the reasoning behind what seems to be an ever-increasing view that the powers-that-be collude to suppress the gold price to hide what is an overall indicator in the decline of the dollar’s purchasing power. Some put this decline at upwards of 80% since President Nixon severed the convertibility of the dollar for gold to protect US gold reserves. In some sectors of the economy this decline is readily apparent. Grocery shopping, property prices, salary levels etc. In others less so, notably transportation and electronics, but in general $100 today would only buy you a fraction of what you could have purchased with $100 in 1971. But it’s not only the purchasing power of the dollar which has been in decline. The same is true of virtually any nation’s currency. All currencies nowadays are fiat in that they have no backing, which is why some economists call for a return to a gold standard. This is probably impractical without a massive gold price increase and, even then, would probably be overrun very quickly by ever increasing consumer demand for goods and services. There is also talk of China trying to introduce some kind of gold backing for the renminbi (yuan) at some time in the future thereby leapfrogging the dollar as the world’s go-to currency, but this is probably more a theory than a likely eventuality. It is seen as the reason China is assumed by many to be building its gold reserves at a far higher rate than it has been reporting, but this may also, if true, be just as support for a future petro-yuan – with the yuan exchangeable for gold – as a very competitive Chinese bid to replace the petrodollar! So perhaps gold investors should treat the latest rise in the gold price purely as a wealth protection exercise. That is what gold is good at over time. If the dollar declines further then gold will rise further, as will all the major precious metals – and most other commodities too. Changes in prices over the 47 years since President Nixon stopped dollar convertibility are self evident, but in geographic areas like Europe where currency purchasing power has diminished similarly the imposition of a new currency, and/or the implementation of other changes like decimalisation in the UK, have made direct comparisons that much harder for the peerson in the street to relate to. But regardless, gold has moved up sharply in dollar terms in the past few days despite mixed economic data out of the USA. Much of this increase so far seems to have passed silver by and the gold:silver ratio has actually risen a little standing at close to 78 at the time of writing, although silver has been making a bit of a late run ahead of the weekend as have platinum and palladium. We still stand by our forecast that the gold:silver ratio will come down to 70 or lower during the course of the year which would make silver potentially a better investment than gold if it does follow its historic pattern and rise faster than gold when the latter is on the increase. At the moment we see no reason to change our forecast for gold to hit $1,425 or thereabouts this year and silver $20.50. As I stated in the article in which I made these predictions- Precious metals price predictions for 2018 – gold, silver, pgms – I look at these forecasts as being conservative and if the dollar continues to fall and precious metals prices to rise sharply. as they have this past week, then I may see the need to adjust the forecasts – at least in US dollar terms. However, also bear in mind that gold and silver had a strong start in 2017, but then tended to pull back. 2018 could see a repeat of this pattern, although I don’t see palladium making the kind of gains it did last year. For those interested in my precious metals stock price forecasts for the year ahead do look at a series of articles i have published on Seekingalpha.com. The terms and conditions for publication of articles on Seeking Alpha prevent me from posting them here, but follow the links to read them on that site. A pre-New Year article published on the Sharps Pixley website – and since posting gold has moved up further and the US dollar fallen some more. The original article – shown below, also pointed to a disappointing performance by silver at the time, but since it was written silver has also picked up nicely and the Gold:Silver ratio come back to below 77. As the final trading session of the year is already under way in Europe and has just begun in North America, precious metals are trending higher, but most of the increase is due to the gradual decline in the dollar index (DXY). Since end 2016 the DXY has been allowed to drop from 102.65 on December 29th last year to 92.29 as I write on December 29th this year. That is a fall of around 10%. Again as I write, the gold price in the US dollar is up around 12% over the full year after its recent rally. Silver, on the other hand, is only up a little over 4% over the same period – a particularly disappointing experience for the silver investor given that historically silver tends to outperform gold in a rising gold market. Silver though is, or should be, somewhat anomalous vis-a-vis gold as it is much more of an industrial metal, although its performance as such may not be the real reason it has underperformed its sibling precious metal in 2017. Silver is a much smaller market than gold and its price can thus be even more subject to futures trading patterns where big money is involved. Silver followers reckon the price is being manipulated in a major way on the futures markets and point to the huge short positions taken in the metal by the big bullion banks and traders as being key to the price patterns. These big shorts do not relate easily to some huge accumulations of physical metal by the same big banks that dominate these short positions – a point being made continuously by silver analyst Ted Butler (probably the world’s No. 1 expert on this anomalous situation) who reckons the activity in the silver markets by the big players – notably by JP Morgan – is, in effect, a criminal activity to which the market regulators continue to turn a blind eye. Of course gold bulls also see the gold market as being manipulated too by many of the same players as in the silver market. But here the motivation, if the gold price is indeed being held down, may be in support of governments and the dollar given the huge global debt position. The gold price is considered by many as a bellwether for the state of the economy and a big rise in gold could be seen as a huge fall in confidence in global economic management. That does not suit the big money and the markets, let alone government policies. Whether there is collusion between major governments/central banks and the bullion banks to keep the gold price suppressed remains arguable, although there is considerable evidence to suggest that this has indeed been policy in the past and thus probably still is the case today. The big question today is whether gold will indeed stay back above $1,300 on the year’s final trading day and what will happen when trading resumes in the New Year. Silver could also possibly break back up through $17 and as I write gold has indeed breached $1,300 and silver looks well placed to break out above $17. These price advances have survived the New York market open and whether they will survive the full trading period at these levels remains to be seen, but the force is certainly with them at the moment. Gold at $1,300 and silver at $17 would put the gold:silver ratio (GSR) at 76.5 which is certainly not unreasonable given that the GSR has ranged between around 67.7 and 79.4 over the past year. Indeed we have gone on record as suggesting the GSR will come down to 70 during the year. Some feel this is a very conservative prediction. 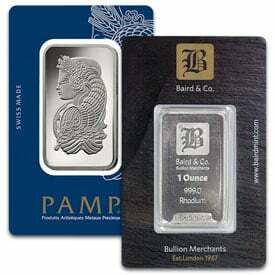 Platinum is also moving up along with the other precious metals apart from palladium which has come off a few dollars. We think there’s a good chance that platinum will be back at a higher price than palladium by the end of 2018, although I have received a recent email from former Stillwater CEO, Frank McAllister, who would strongly disagree having published a paper back in 2012 that palladium and platinum should at least be on a par with each other. He further suggested that the demand for palladium in the autocatalyst sector could well drive its price ahead of platinum. He has certainly been correct in this viewpoint. Ted Butler’s latest theory, is also worthy of comment. He avers that JP Morgan was in effect given a 10-year carte blanche by the U.S. Government and regulators as a reward for its assumption of the huge Bear Stearns short position in silver, at the government’s prompting, when that bank collapsed in the 2008 financial crisis. That 10 year period will now be up in 2018 and, if Butler is correct in his suggestion, JP Morgan could now be in a position to reap multi-billion dollar rewards from unwinding some of its silver market activities. Butler though has been permanently bullish on the silver price and some of his theorising, however well supported in fact, may just be wishful thinking. BUT – he could also be correct and if he is there could be a run up in the silver price that would at least match that of 2011 when the metal peaked at just short of $50. Silver investors will certainly be nailing their colours to that mast! And if silver runs in this manner it could drag gold up with it too. The tail wagging the dog! Eastern demand appears to be holding up fairly well. While neither of the two leading consumers – China and India – are importing gold at their past record levels, demand appears to have been increasing in 2017 over that of 2016 and we would expect that trend to continue along with the gradual increase in percentages of their populations falling into the middle class (and potentially gold-buying) categories – a growth that is being echoed around the world. Geopolitics could also be playing a role here, although the gold price has been showing little sign of any sustained upwards movement with some of the worrying events taking place around the world and President Trump’s seemingly increasingly combative rhetoric which could be considered destabilising. However we have noted that the passing of major holidays often seems to mark an inflection point in market behaviour and perhaps Christmas 2017 is yet another one of these. So far the portents for gold and the other precious metals look positive. It remains to be seen how they play out through the year ahead. Precious metals stock picks made a year ago were mixed, but more than half beat the record growth in the S&P 500. Most of the new 2018 precious metals stock picks are the same as those for 2017, but there are some deletions and additions. For the record looking for higher prices in the year ahead for gold, silver and platinum, but perhaps a fall back in palladium in the second half of the year as we start seeing reverse substitution by platinum catalysts in the petrol (gasoline) section of autocatalyst manufacture due to the platinum price being lower than that of palladium. Stock selections are virtually all in stocks which won’t collapse should precious metals not perform as expected. Another article – this time on pgms – published today on the www.sharpspixley.com website. This morning, as I write, the palladium price is sitting at $1,024 an ounce, aided by a small fall in the dollar index following on from the latest statements from the U.S. Fed and the ECB, while platinum was at only $882 an ounce. This is a massive deficit of almost 14% for the platinum group metal (pgm) which has for most of time been at a substantial premium over the former. But can palladium’s price advantage be sustained? The answer is almost certainly not in the medium to long term – while in the ultra long term the future for all the platinum group metals looks pretty bleak given the likely rise in Electric Vehicles (EVs) sales and a matching decline in Internal Combustion Engine (ICE) driven units. The principal usage these days for palladium and platinum is as a catalyst in ICE exhaust emission control systems. Platinum remains predominant in the diesel emissions control market, but diesel, in the car market has had a bad press and sales have been slipping, particularly in Europe and Asia, while it has never really taken off in the big U.S. automobile market. Over time the then high price premium of platinum (once the preferred emissions control catalyst for all kinds of ICE driven vehicles) over palladium has led to the development of what was then far cheaper palladium/rhodium emissions control catalytic exhaust control system for the predominant petrol (gasoline) driven car market. But how long can this last with palladium and rhodium commanding the premium price slot? It is true that palladium demand appears to be in a substantial deficit at the moment, thus accounting for the rapid price advance for palladium which as risen in price by some 40% this year. However a switch back by manufacturers to what appears to be a marginally more efficient platinum-based catalytic converter system, which would be currently considerably less costly given comparative pgm prices, could well mean that platinum demand will rise and palladium will fall. This will take time, but the longer palladium remains at a price premium over platinum the bigger the incentive to switch back to a platinum-based catalyst system. 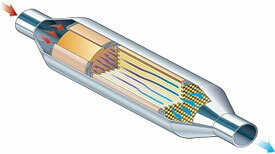 Gearing up to a reverse switch of this type could happen far more quickly than is currently anticipated given the manufacturers of emission control catalytic systems are already producing platinum based systems for the diesel market. The global ICE-driven vehicle market is enormous, and likely to remain so until early in the next decade at least, despite an increasing take up of EVs. This will not happen overnight and ICE-driven cars are expected to dominate the auto market for at least the next ten years, although beyond that we see EVs becoming dominant and demand for platinum, palladium and rhodium slipping away – drastically as the trend to EVs continues. But that still leaves a good few years when pgms will remain dominant in the sector – but which ones? There is also perhaps a better correlation between platinum and gold prices, with increases in the latter tending to drive similar increases in the former. 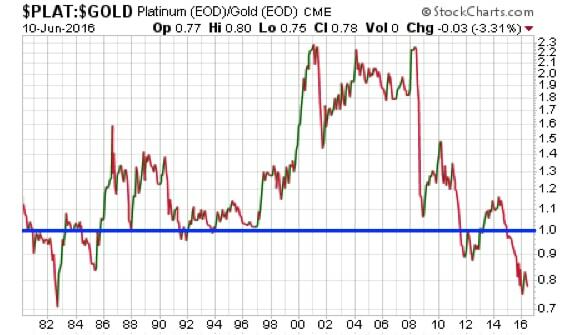 Historically the platinum price has been higher than that of gold most of the time, and some analysts suggest that that price premium could re-appear – although this writer would disagree with that argument given the potential long term decline in pgm demand noted above. But if the gold price does rise over the next few years, as we anticipate, it seems more likely to drag platinum up with it than palladium, given the stronger jewellery demand for the former. But then if platinum again becomes more expensive than palladium we could see the exhaust catalyst demand switch around yet again, assuming the current price differential does lead to perhaps a temporary platinum demand dominance again. But this may all happen too late for the ultra-long term futures for either metal. They will both suffer from what we see as the inevitable rise of the EV in the personal transportation sector – and ultimately in the heavy truck sector too, although this may be slower to come about. The best performing precious metal for the week was palladium, up 5.49 percent. Citigroup forecast that platinum could see a deficit of 172,000 ounces in 2016, but palladium’s deficit could be short by 847,000 ounces, thus the group is more bullish on the later. Esturo Honda, who according to Bloomberg News has emerged as a matchmaker for Prime Minister Shinzo Abe in finding foreign economic experts to offer policy guidance, is opening his ears to Ben Bernanke. In April, Bernanke noted that helicopter money, in which “the government issues non-marketable perpetual bonds with no maturity date and the Bank of Japan directly buys them,” could work as the strongest tool to overcome deflation, says Honda. Francisco Blanch, head of commodities research at Bank of America Merrill Lynch, says there is political risk building into the gold market, including the Italian referendum and U.S., French and German elections. Blanch adds that in the past, gold used to be driven more by the U.S. dollar and commodity market movements, but “in this day and age, it’s a new world.” He also mentions that one-third of government bonds are yielding negative. The chart below shows that $9.2 trillion of sovereign bonds are trading with negative yields. The worst performing precious metal for the week was silver, down -2.97 percent. With silver generally more volatile than gold, a strong rally in stocks, up 10 of the last 11 days and with new record highs, had investors chasing returns in the broader market. Gold traders and analysts are bearish for the first time in four weeks, reports Bloomberg. The precious metal headed for its first back-to-back weekly decline since May, with gains in equity markets and the dollar hurting prices. David Meger, director of metals trading at High Ridge Futures in Chicago, says that the dollar’s strength continues to pressure most commodities, gold in particular. “Safe-haven demand has been diminishing, obviously with equity markets moving to new record highs,” Meger said. The World Gold Council and the Accounting and Auditing Organization for Islamic Financial Institutions are drafting new standards for investing in gold to comply with Sharia law, reports an Energy and Capital article. If the proposals for the changes (expected in the fourth quarter) are accepted, a flood of new investors could help send gold prices soaring, the article continues. A similar situation took gold prices to $1,900 in 2011 when surging demand came from China following the government’s urge for its citizens to own the yellow metal. With the U.S. presidential election seen as the next big catalyst, Bill Beament of Northern Star Resources believes that gold’s rally is set to endure, reports Bloomberg. He says the overall trend is up and that “the U.S. vote will have more of an impact on bullion than the U.K. referendum.” The IMF also scrapped its forecast for a pickup in global growth, the article continues, yet another positive for gold. Commerzbank raised its year-end gold estimate by $100, reports Bloomberg, to $1,450 an ounce. Similarly, DBS Group Holdings says that gold is in a major bull market and could surge past $1,500 an ounce as “low interest rates buoy demand and the U.S. presidential election looms.” The long-term gold price has been adjusted higher at Numis Securities as well, up to $1,400 an ounce from $1,350 an ounce. While it’s good to see the street starting to take their price forecast higher for gold, investors should remain disciplined as the late summer can be a seasonally weak period for prices and many of the expected price targets being raised are capitulation moves to higher price levels. According to data compiled by Bloomberg, investors pulled $793 million out of SPDR Gold Shares last week, the most since November. As Citigroup’s U.S. Economic Surprise Index rose to its highest since January 2015 (a sign of an improving economic outlook), demand for ETFs backed by gold has diminished some. Holdings in gold-backed ETFs around the world fell 3.9 metric tons last week, reports Bloomberg. Will gold miners maintain their capital discipline? Bloomberg reports that as the price of gold rises to its best first half of the year in nearly four decades, earnings reports could indicate that miners are preparing to ease in terms of spending. “Historically there’s been a very high correlation, almost a one-to-one correlation, between costs and the gold price, implying that with higher gold prices you will likely see costs rise at the same time,” Josh Wolfson of Dundee Capital Markets said. Wolfson added that a majority of miners structured spending based on the assumption that gold will trade between $1,100 and $1,150 an ounce. Let’s hope the miners learned something over the prior three painful years of falling gold prices. South Africa’s biggest domestic gold miner, Sibanye Gold, has confirmed that it is to acquire Anglo American Platinum’s (Amplats) Rustenburg platinum mining operations. Sibanye was spun out of Gold Fields as a separate company some three years ago, and in its own right is already the world’s 10th largest gold miner in terms of gold output – 49.4 tonnes last year. Assuming the Rustenburg acquisition goes ahead, and there’s no reason to suggest that it will not, the company will also become the World’s fifth largest producer of platinum group metals with current output of over 800,000 platinum ounces per year – around 13% of global new mined platinum output based on the latest quarterly production figures as assessed by the World Platinum Investment Council. Sibanye’s CEO, Neil Froneman, is of the opinion that now is the ideal time to make such an acquisition given his view that precious metals prices are currently at, or near, their likely low points in the commodities cycle. Even so it is something of a gamble given that many of the operations are marginal producers at the current platinum price, albeit just about profitable in the first half of 2015 in generating cash of around US$19 million – but the platinum price is currently around 10% below its half year average. Amplats has, however, been rationalising operations at Rustenburg, closing unprofitable sections and reducing the labour force and will continue this process until the transaction is complete. The Rustenburg platinum mining operations are similar in many ways to Sibanye’s gold mining operations involving narrow ‘reef’ structures, and are exceedingly difficult to mechanise without excessive ore dilution. Because the rocks are younger than in the Witwatersrand gold mines, the rock temperature gradient is higher and there can be problems in dissipating heat as the mines get deeper – but in general the Rustenburg operations are not as deep as the gold mines and the platinum reefs are generally more consistent in dip and grade. Sibanye has excellent experience and a good track record so far in working these types of narrow reef horizons and is confident it can carry this over to Rustenburg. Should precious metals prices pick up this will be seen as a very opportune acquisition, although if not the operations could prove to be a short term drag on the company’s financial performance. There are some inbuilt protections against this in the proposed deal, while there are also arrangements which will limit Sibanye’s potential profits from the operations over the next six years should pgm prices and profitability pick up. The full Sibanye media release is set out below – and a more detailed report on the proposed transaction is set out on the company’s website – www.sibanyegold.co.za where the full SENS (Johannesburg Stock Exchange’s Stock Exchange News Service) statement is available. Sibanye today announced the proposed acquisition of the Rustenburg Operations from Anglo American Platinum Limited (“AAP) for an upfront consideration of R1.5 billion in cash or shares and a deferred consideration equal to 35% of the distributable free cash flows generated by the Rustenburg Operations over a six year period, subject to a minimum nominal payment of R3 billion(“Deferred Payment”). Should there still be an outstanding balance at the end of the six year period, Sibanye may elect to extend the period by a further two years. Any remaining balance at the end of this period will be settled by Sibanye either in cash or shares. In addition to the Deferred payment, which allows for a favourably extended payment period; should the Rustenburg Operations generate negative distributable free cash flows in either 2016, 2017 or 2018, AAP will be required to pay up to R267 million per annum to ensure that the free cash flow for the relevant year is equal to zero. This provides important capital investment and downside price protection for Sibanye, facilitating ongoing capital investment in the first 3 years following the conclusion of the Transaction. Should higher prices result in early repayment of the Deferred Payment during the first 6 years, Sibanye will share the upside with AAP. Consistent with its transformation objectives, Sibanye will be including a consortium of Broad Based Black Economic Empowerment stakeholders (“BBBEE Stakeholders”) such that, at the closing of the Transaction Sibanye will own 74% of the Rustenburg Operations, with the BBBEE stakeholders owning 26%. Discussions are underway with the following broad based partners: employees, the surrounding community, the Royal Bafokeng Holdings and the Bakgatla-Ba-Kgafela Traditional Community. The Rustenburg Operations are located centrally on the Western Limb of the Bushveld Complex, near the town of Rustenburg and comprise the Bathopele, Siphumelele, and Thembelani (incl. Khuseleka) mining operations, two concentrating plants, an on-site chrome recovery plant, the western limb tailings retreatment plant and associated surface infrastructure as well as approximately 4 months of working capital on a going concern basis. The lease area covers an extensive 28 km strike length with the ore body extending 8 km down dip. Current PGM (4E) Mineral Reserves comprise approximately 9.7 million oz and Mineral Resources 88.8 million oz. With annual production of over 800,000 oz the Rustenburg Operations are placed firmly as the fifth largest PGM producer globally. AAP recently rationalised and restructured the Operations, eliminating loss making production and reducing the workforce by approximately 7,500 people. Operational optimisation will continue under AAP until the conclusion of the Transaction, but in H1 2015, the Rustenburg Operations generated approximately R261 million in cash, despite prevailing low PGM prices. ROYAL CANADIAN MINT places innovative anti-counterfeiting device in the hands of..
COMEX On The Edge? 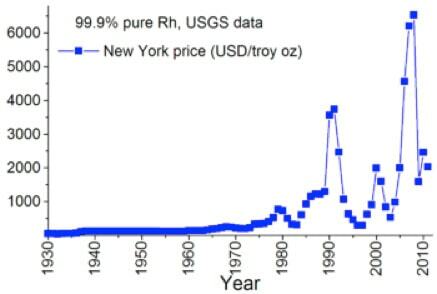 Paper Gold “Dilution” Hits A Record 124 For Every Ounce Of Ph. Silver Supply A “1.5 Or 2.0 Of Ten” – And One Of The Potentially Last ..
Pan American Silver Reports Increased Silver and Gold Production and L..
3 Big Reasons to Buy Silver Wheaton Corp.
AURUBIS’ recycling operations benefit from refining charges and input ..
Will These Miners Survive The Current Commodity Bear Market: Lonmin Pl. Who the hell wants to be in platinum? Recent research into the hydro-processing catalysts market just publis.. Monthly gold production reached a new monthly low in January, according to data released by Stats SA. Although a number of temporary factors might have contributed to the unusually low level, general historical trends show that gold has lost the prominent place it once had in the South African economy. Stats SA has published comparable mining production indices that go back as far as January 1980, for the industry as a whole as well as for various minerals, including gold, iron, platinum and coal. The indices provide an indication of the level of production, set against a particular base period. Currently, the index has been set to 100 for the base period of 2010. Historical values of the gold index show the extent of how production has fallen. In January 1980, the index was 359,0, while the volume of gold produced was far lower in January 2015, resulting in the low index of 48,4. In other words, South Africa produced 87% less gold in January 2015 compared with the same month in 1980. Figure 1 shows how the monthly gold production index has fallen. What is not shown in the graph, however, is that production started on its downward trend well before January 1980. The fall in production has reduced gold’s contribution to the South African economy. The metal contributed 3,8% to gross domestic product in 1993, falling to 1,7% in 2013. In terms of sales, gold made up 67,0% of all mineral sales in 1980, falling to 12,5% in 2014. Coal currently leads the pack, having contributed 27,0% of total mineral sales in 2014. South Africa has also fallen in global gold production rankings. Prior to 2007, the country held the number one spot as the top gold producer in the world, according to the U.S. Geological Survey Mineral Resources Program. By 2014, South Africa had dropped to sixth place, according to Thomson Reuters GFMS, falling behind other countries such as Peru, USA, Australia, and Russia. China is currently the world’s top gold producer. So with the waning importance of gold to South Africa, does the future hold any promise for the industry? One estimate suggests that the country will soon need to look beyond the precious metal as a major resource. Stats SA’s 2014 Environmental Economic Accounts Compendium provides 2011 estimates on depletion rates for various minerals. At current production levels, South Africa will exhaust its coal resources in 119 years, and platinum in 218 years. For gold, resources will be exhausted in only 33 years. An update to theCompendium is due for release before the end of this month, containing new depletion estimates, but if this estimate holds true, many South Africans alive today will see the country taking on a much reduced role on the global gold mining stage. Given the fall in the gold price over the past three years, this will also have impacted adversely South Africa’s income from this source as well. Indeed current metals and minerals pricing across the board will be having a damaging effect on the country’s exports and economy. With even bigger falls in coal and iron ore, both of which are significant for the South African economy, and a comparative fall in platinum , South Africa’s other principal metal export by value, the government is surely wrestling with a significant change in its balance of payments, whichis thus a contributor to the large falls in the South African Rand against the rampant U.S. dollar. Indeed, were it not for the fall in the Rand, which has applied something of a cushion in terms of Rand earnings, the production figures for the county’s metals and minerals might well have fallen further. The fall in the Rand has enabled some marginal operations to stay afloat which otherwise would probably have closed down. As for South Africa’s gold mines, the major Witwatersrand operations are getting ever deeper (which substantially increases mining costs and dangers, and grades are declining and there is little prospect of significant new discoveries to replace the output falls. One can see little chance of anything but a continuing drop in output year on year unless there is a very significant rise in the gold price in the offing.